1. Before you think I have lost my marbles with this salad, at least give it a try. It looks and tastes wonderful for the holidays. Also, there are two fruits that might intimidate you, but don’t let them. Get out there and try something new. 2. Find a large mixing bowl to place all washed, peeled and chopped fruit. 3. Lets tackle our first “intimidating” fruit. 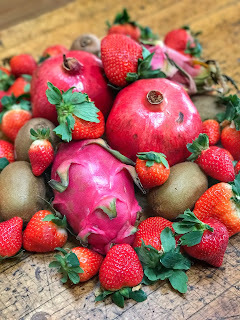 To peel a dragon fruit is very similar to an avocado minus the LARGE pit in the middle (bonus). Half it, cut around the outside edges, and scoop it out. It looks amazing and is incredibly healthy for you. I found it easiest to cut into cubes for the salad, but cut it however makes you happy. Add that to the mixing bowl. 4. Lord have mercy you made it through and past those “intimidating” new fruits. I’m proud of you for stepping outside of your comfort zone; and your company trying this amazing fruit salad will thank you too!!! 5. Now it’s the easy part. Peel and slice your kiwi. Wash your strawberries and quarter them like normal. Add those two familiar fruits to the mixing bowl and give everything a good toss. 6. 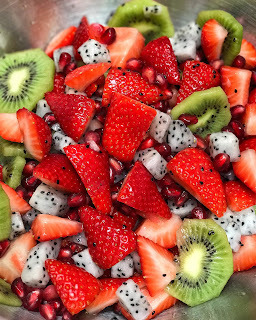 Take a moment and look at the colors of this fruit salad. It literally looks like Christmas in a bowl. This is hands down the healthiest and prettiest salad you can bring to any holiday party. 7. Merry Christmas and Enjoy!!! « Broccoli Salad….It’s Kind of Healthy!